As this is the season for family moviegoing, The Grinch throws its hat in the ring as a solid offering to spend one’s hard earned money on. In 1957 Random House published Dr. Seuss' How the Grinch Stole Christmas. It told the story of a green, furry creature who hated Christmas - can you believe that!?! Over the past sixty-one years, it has been made into several movies both animated and live-action. This holiday season Illuminations has taken on the challenge with its own twist on the classic tale in The Grinch. This version keeps the bare bones of the original but slightly alters some of the details and characters in a delightful tale that will be fun for audiences of all ages. The Grinch (Benedict Cumberbatch; The Imitation Game) is a lonely person who lives in a cave at the top of a mountain. There he would sit looking down on Whoville and all the Whos who live there. Every year in December he cringes as he watches the Whos decorate and celebrate the Christmas Holiday. Interestingly, this iteration of the story attempts to explain why the Grinch hates this holiday so much. As the movie shows, the Grinch was an orphan and every year at Christmas he would watch the happy families decorate and exchange presents – something he never got to do. This year, however, he formulates a plan to rob them of their joy and happiness as he steals their Christmas. He spends several days logistically figuring out how to remove all their lights, trees and presents so they wake up on Christmas morning to nothing. Unfortunately, he crosses paths with Cindy Lu Who (Cameron Seely; The Greatest Showman) who, thinking he is Santa Claus, wishes her mother can get some time off to relax. This simple, unselfish wish along with all the whos singing, despite having everything stolen, cause The Grinch to have a change of heart (literally) and he returns all their presents. Cumberbatch is a smart choice to play this iconic character as his tonal performance portrays just the right blend of sarcasm with earnest hate while offering just a touch of sadness that makes you want to pity the mean, old guy. The supporting cast includes not only Seely but Rashida Jones (Park and Recreation), Kenan Thompson (Snakes on a Plan), Pharrell Williams (Pitch Perfect 2) and Angela Lansbury (Murder, She Wrote). Williams' smooth voice is soothing as the narrator and Thompson ads some well placed comedic moments with his quick timing. The rest of the cast compliments Cumberbatch well and vocally blend well together. The real treats here are the script and the animation. The former is smart with some witty jokes and well placed emotional moments while the latter is exceptional. This film offers some of the best animation I have seen in a long time. Every strand of hair or fur moves effortlessly and the colors are so vibrant they leap off the screen (even in the 2D version). Illumination Entertainment did a wonderful job bringing these characters to life and making the film visual masterful. It will be interesting to see if the audience will embrace the changes to the original story or if they will feel Illumination should have stuck with the more traditional tale. Regardless, this is a fun, family movie that will do well this holiday season as all ages can enjoy it together and while the merchandising possibilities are endless I, for one, hope they make a Fred stuffed reindeer. 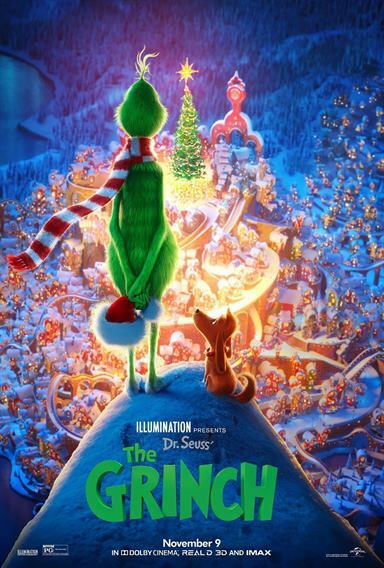 As this is the season for family moviegoing, The Grinch throws its hat in the ring as a solid offering to spend one's hard earned money on. Download The Grinch from the iTunes Store in Digial HD. For more information about The Grinch visit the FlickDirect Movie Database.